Knoxville football fans planning a fall trip to catch a Cleveland Browns game now have an easy way to get there. Express bus operator Megabus announced today it has launched connecting service from Knoxville to Cleveland. The Browns are a new favorite team for some Knoxville football fans since the team was purchased last year by Knoxville businessman Jimmy Haslam, CEO of truck stop operator Pilot Flying J, which is under federal investigation for fuel-rebate fraud. 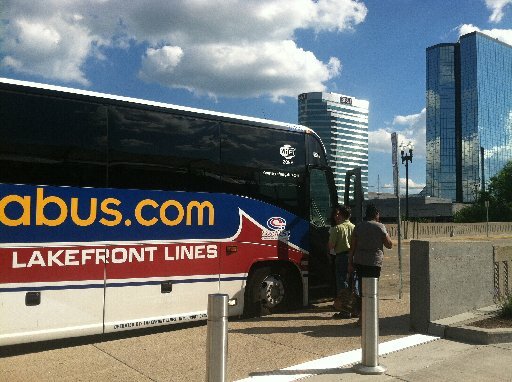 Megabus is offering daily service from Knoxville to Cleveland, according to a news release. Buses will leave the Knoxville Transit Center at 301 Church Ave. for Cincinnati and Columbus, Ohio, with connections to Cleveland. Megabus is known for selling some seats for as little as $1. The bus ride from Knoxville to Cleveland takes about 12 hours, according to the Megabus website. Don’t expect to rub elbows the the team owner. Haslam has a plane. In Cleveland, Megabus will drop off and pick up passengers at the Stephanie Tubbs Jones Transit Center near Cleveland State University. Football fans will have to make their own way to and from FirstEnergy Stadium, home of the Browns. This entry was posted in Megabus and tagged Cleveland, Cleveland Browns, express bus, football fans, Jimmy Haslam, Knoxville, Megabus, Pilot Fying J on August 1, 2013 by Roger Harris. Pilot Travel Centers and part-owner of the Pittsburgh Steelers, says he has “no special plans to watch” tonight’s NFL player draft. But the head of the Knoxville-based company had stronger comments on the suspension of the Steelers’ star quarterback Ben Roethlisberger. “The NFL obviously takes very seriously the behavior of their players and rightly so, as do the Pittsburgh Steelers,” Haslam said. “We are certainly very disappointed in Ben’s behavior. “We hope this will be a life-changing event for him and are looking forward to seeing him straighten his life out and get back on the right path. Roethlisberger was suspended for six games in the wake of a sexual assault investigation in Georgia. Haslam bought a minority stake in the Steelers a little more than a year ago. This entry was posted in Jimmy Haslam and tagged Ben Roethlisberger, Jimmy Haslam, Pilot Travel Centers, Pittsburgh Steelers, suspension on April 22, 2010 by Roger Harris.